This Nintex tutorial explains, how we can start working with Nintex Workflow for Office 365 in SharePoint online. What are the advantages of using Nintex workflow over SharePoint designer workflows in SharePoint Online? 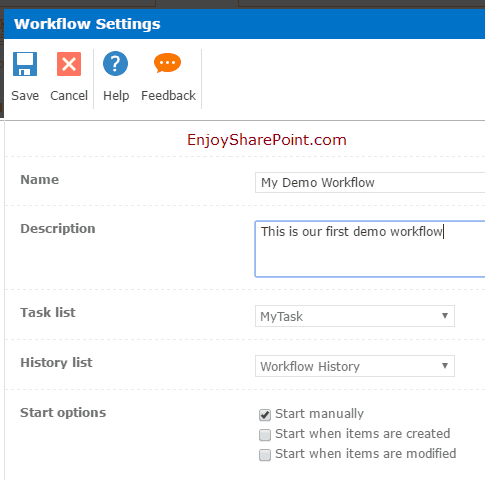 How we can add Nintex workflow app from the Office Store to the SharePoint Online site. Also, I will explain how to create your first workflow using Nintex workflow. There are different ways and tools we can use to develop workflows in SharePoint Online Office 365. Develop workflows using SharePoint Designer 2013: We can also develop workflows using SharePoint designer 2013 for SharePoint Online Office 365 sites. Develop workflows using Visual Studio 2015/2017: We can also develop workflows using visual studio 2015/2017 for SharePoint Online. But it requires developer knowledge and requires lots of time to develop workflows. Develop workflows using Nintex Workflow for Office 365: We can also use 3rd party products like Nintex to develop workflows for Office 365 SharePoint Online. Nintex has workflow products for SharePoint On-premise as well as SharePoint Online versions. The SharePoint Online version is known as Nintex Workflow for Office 365. You do not necessarily require developer knowledge to develop workflows. One of the main features is, it is very easy to use, simply we can drag and drop to create and edit workflows. We can save lots of time by using Nintex workflow. Apart from this, there are more actions available compared to SharePoint designer workflow actions and also we can customize with CSS. We can do everything in the browser itself, we don’t not any external software. We can not have state machine workflows in the SharePoint designer but it is possible in Nintex workflow. We can communicate on Twitter, Facebook, and Yammer also. We can use Nintex workflow app in mobile devices also. We can easily develop multi-level approval workflows, Lazy approval workflows, scheduled workflows etc. We can easily add Nintext Workflow for Office 365 app to our Office 365 SharePoint online site from SharePoint store. Open your SharePoint online site, then click on Add an app. In the Your Apps page, click on SharePoint Store on the left side. Here search for “Nintex Workflow for Office 365“. Then click on Add to add Nintex workflow. They provide a full-featured 30-day trial which you can add to test the functionality. If you do not have an Office 365 site, sign up for an Office 365 trial. Once it is successfully added then you can see the app in the Site Contents page. There are basically two types of workflows you can create in Nintex, Site workflows and List workflows. To create a list workflow we have gone the individual list. But to create a site workflow, form Site Contents page click on the Nintex Workflow for Office 365 app which will open the workflow Gallery. Here we can create a new site workflow. Since I am using a trial version, it is displaying me the license information to buy the product. Just click on “Go to the designer” button. This will open the Workflow Gallery. Here it will give the option to Create a new workflow as well as it displays all the workflows attached to the list. You can also select the existing workflow, edit or delete existing workflows. Click on the Create New list workflow button to start creating a new workflow. Then it will open the workflow designer. Here in the left side, it displays various workflow Actions category wise and in the Ribbon, we can see various buttons like Save, Publish, New Open, Import, Export, Settings etc. And in the center of the page, you can see the start and stop flow chart kind symbol. Inside the start and st,op we can add our actions. Here we will try to write some text along with the Item title. First, write the text in the message box and then from the Right side Insert Reference, click on the Title column name. Now if you will look at the workflow designer then there will be no warning icon. The workflow looks like below and is ready for deployment. From the ECB menu of the item, Advanced -> Workflows. This will open the workflow page and it will display the workflow which we have deployed to the list. Click on the workflow (My Demo Workflow) to start the workflow. In the workflow, we have added two Log to History action. If you will open the History list or if you will go to the Workflow details page you can see the messages that we have put. This Nintex tutorial explains how we can start with Nintex Workflow for Office 365? What are the advantages of using Nintex Workflow for Office 365 over SharePoint designer workflows? Also, we discussed how we can start our first workflow using Nintex Workflow for Office 365 in SharePoint online? Next Article How to set default value for lookup column in Nintex forms for Office 365 SharePoint online?